A few weekends ago (6 June) we went to the 25th Aviation fair at Pardubice airport in the Czech Republic. For anyone who is interested in aeroplanes or war history, this is a must-see. It must have been one of the hottest days of the year, but the organizers did a good job of cooling down the crowds. A truck went around spraying the concrete ground with water, which cooled it off significantly. Because it was so hot, people were always happy to see this truck came past, and followed it to stand for a bit in the water spray. The guys riding on the truck also sprayed water over the sweltering crowds following behind, to everyone’s delight. There was also free drinking water available. You can see how hot it was by how everyone is hiding in the shade under the wings of the planes! The history of Rudolf Borovec is written here, and is very interesting. During world war 2, after Czechoslovakia was invaded by the Nazi Germans, many Czech pilots left the country and went to Britain, where they flew for the Royal Air Force. My grandmother (who was Irish British and living in London during world war 2) remembered showing some of them around London with friends. It’s hard to believe that the whole of Europe was a war-zone only two generations ago. At the aviation fair there was also an area in which military tents were set up, also with all the old equipment, and it was very interesting to see it, almost like a trip back in time. And of course, there were many interesting aeroplanes from former times on display, and many of these were also flown around so you could see them in action. 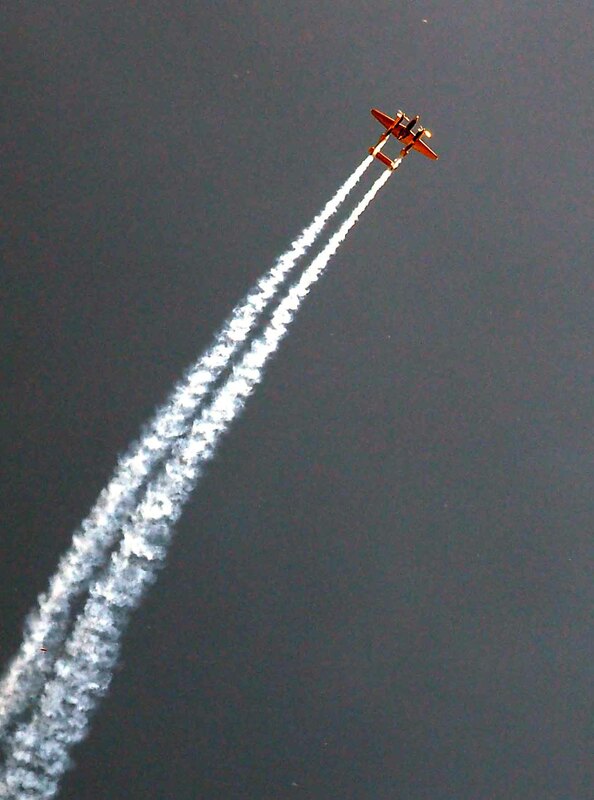 What really surprised us was seeing an acrobat riding on top of one of the planes while it was flying! There were also some old cars and a fire wagon, as well as stalls to buy food, drinks and aircraft-related souvenirs. Here are some photos of the planes that were on display that day. You have a Hurricane, F4U Corsair, Messerschmidt 109, Junkers, Mustang, Sopwith Camel,P52 Lightening and a Spitfire, among others. Thanks, good to know as now I can look up a bit about the history of some of them. The show is every year in Czech Republic in case you ever find yourself in the neighbourhood! Well ….. you never know?